I’ve been under the weather for the past week and I haven’t had the energy to really pull together any sort of outfit. I woke up on Thursday morning feeling a lot better than I had since last Wednesday and I immediately knew I needed to go outside. I’m not the type of person that likes staying home for too long so I needed to find any excuse to leave. Thankfully my friend asked me to go out with her and I grabbed at the chance. I’m still not feeling the greatest so I didn’t really bother to put as much effort into my outfit and I didn’t feel compelled to take as many outfit photos but these will do. I purchased some black lipstick this summer and I’ve been trying to find the perfect opportunity to wear it. I was completely unsure of how to wear it, in fact I think I still need to play around with makeup and technique. The lipstick doesn’t actually stick to my lips as well as other colours I’ve purchased. I’m going to continue to play around and figure out the perfect way to use this colour. I really did end up liking it on me and its such a dramatic look that I can’t playing it up. For anyone wondering this is Manic Panic’s black lipstick. I would suggest buying this as a way to get acquainted with the colour until you move up to a more expensive, better quality brand. It isn’t long lasting at all and it came off immediately after eating but it was really expensive ($8 on ebay) so I’m not complaining. In between coughing, sneezing and a swollen lip I’ve been over the moon about my brand new tattoo. 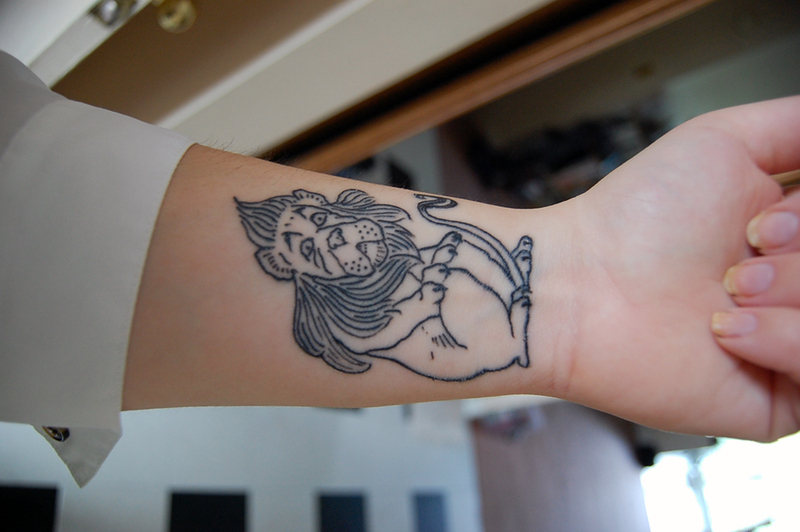 Anyone who has ever discussed tattoos with me knows just how long I’ve wanted the Cowardly Lion tattooed on my wrist. He is described as a cowardly, scared creature who, in spite of all that, still performs courageous acts in the face of fear. He dream of having courage but failed to realize that he had it all along. When I look down at this tattoo I’m reminded of the small and not so small moments of fear I have overcome and that I still have the courage to get through. I'm so sorry to hear you've been sick! This is such an incredible look, however, and the black lipstick really compliments it! The black lipstick looks fab on you, you should rock it more often! !